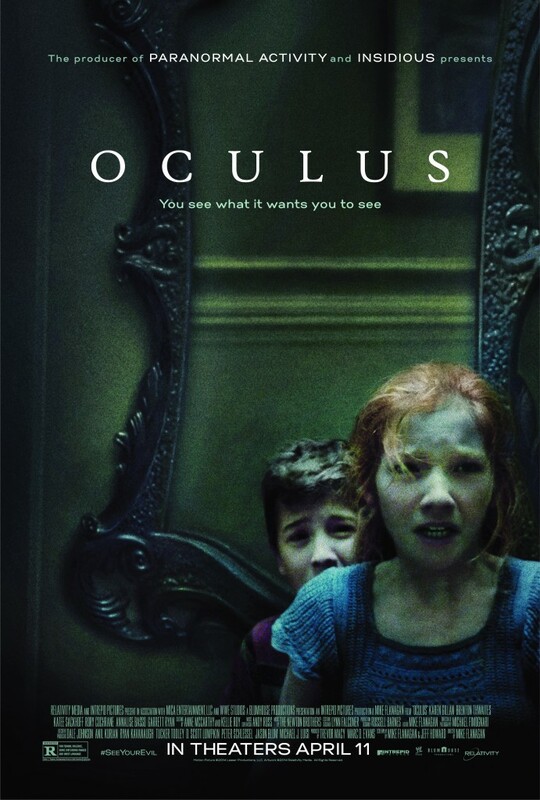 “Oculus” sounds like something you might pick up at a Turkish bath house, but it’s actually the new feature film by writer/director Mike Flanagan (“Absentia”). He was born in Salem, Massachusetts, so you can just imagine what his bedtime stories were like. It’s a big day for Kaylie, (Karen Gillan from “Not Another Happy Ending”) as she has finally found the old mirror her father had used to have in his office. She also gets to pick up her brother, Tim (Brenton Thwaites from “Knocked for Six”), from his 10-year stay at a mental institution for killing their father when he was 13. The old man had it coming, if you ask me, after he tortured and killed their mother. So on their first night of this family reunion, Kaylie and Tim join together to kill the evil presence in that old mirror to prove that Tim is innocent and neither of them are crazy. I would have demanded a night at TGI Friday’s, but these kids had a different kind of childhood. The years in “therapy” had convinced the younger Tim that he imagined most of what happened that night as a way to cope with what he had done. We spend most of the movie trying to decide whose version is correct, his or Kaylie’s. Virtually the entire movie takes place in the old family home with just a few characters, which is a good prescription for an indie horror flick. The rope was kept taut, and by that I mean the thematic tension and the hoist to the swinging anchor battering ram. It’s nice to see a scary movie that works without lots of blood and guts, although there is a little blood and a poor display of dental hygiene. The lead actors are not well known, but they performed extremely well. It is easier to suspend disbelief when you have no connection to the people on the screen. They could have called this movie “The Mirror Has Two Faces” and brought back the chunky Streisand, but then I would have rooted for the mirror. Flanagan has developed a nice movie here and used the mirror in some innovative ways. You are supposed to recognize what you see when you look in a mirror, but this one makes you do things you can’t remember. When I was a kid we called that alcohol.